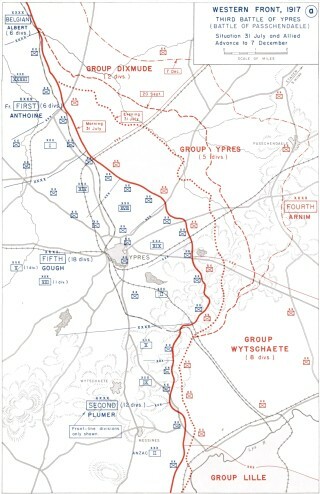 Map of the Battle of Paschendaele, 1917. First news of Richardson's bravery. Incredible bravery of WWI tank crew who survived 72 hours being bombarded by both Germans and their own side. Daily Mail Online. 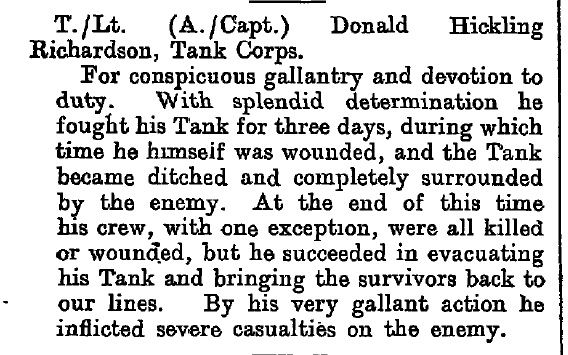 Leader of the heroic tank crew of the ‘Siege of Fray Bentos’, Paschendaele, 1917. Donald Hickling Richardson was the son of M.P. Arthur Richardson, who with his family lived at ‘The Croft’, Easthorpe (Bottesford) from 1918 to about 1930. Arthur Richardson was a Labour-Liberal MP who in 1917 voted for Ramsey-MacDonald’s parliamentary motion to stop the war. The Birmingham edition of the Daily Mail of Friday, July 27th 1917 (National Newspaper Archive), reported the debate regarding the call for an end to the fighting, as follows: “Pacifists Rebuffed. Michaelis, not Reichstag counts. Mr O’Grady & British Leninists. In the House of Commons, Mr Ramsey McDonald’s resolution found only 19 supporters. The nineteen members who voted for the pacifist amendment last night were: Four Labour men – Messrs R MacDonald, Snowden, Anderson, Richardson; and fifteen liberals … “. 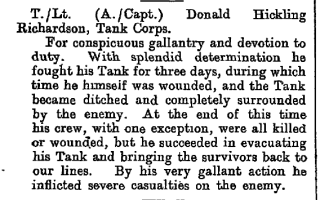 It was perhaps an irony that his son Donald was, in August of that year, to become engaged in a desperate fight when his tank became stuck in the mud behind the German lines. Most of the eight man crew escaped alive, and Captain Richardson received the MC and Croix de Guerre. After the war, Major Richardson and his wife Mary enjoyed a long life. He passed away in 1977, she in 1984. Arthur Richardson was born in East Bridgford, Nottinghamshire, and worked as a grocer and tea merchant, eventually forming is own business. He also had a career as a Member of Parliament, sitting as the member for Rotherham during the war years. He became MP for the Nottingham Southern Division in 1906 to 1910, then campaigned in Melton from 1912 to the outbreak of the war. In 1916 he was elected at Rotherham (unopposed), and in the General Election held late in 1918 he unsuccessfully contested Nottingham West. He stood for Melton in 1922, 1923 and 1924, but failed to be elected, and then stood down from his parliamentary career. After this, he concentrated on running his business, and around 1930 moved to Edwalton. He died in 1936, aged 76. At the funeral, Reverend J.E. Laking said that Arthur Richardson had “greatly improved the business and public life of Nottingham” and that “his name stood for fairness and integrity”. The parishioners of East Bridgford erected a lych-gate at the parish church in memory of Arthur Richardson and his wife, who had died in 1934. Donald Hickling Richardson was born in 1893 in Nottingham. As recorded in the 1901 census, the family at 6, Park St, Nottingham, comprised Arthur Richardson, aged 41, a wholesale gardener from East Bridgford, his wife Frances, aged 41, born in Nottingham, and four children Arthur W. aged 13, Dorothy aged 11, Muriel aged 8 and Donal(d) aged 8. In the 1911 census, Donald Richardson was stated to be a visitor at Springdale, Clare Valley Park, Nottingham, the home of land surveyor James Calvert Wilson, his wife Edith, and their daughters Mary Dorothy (aged 19) and Edith Lilian (aged 16). At this time Donald, aged 18, was working as a bank clerk. Donald Hickling Richardson and Mary Dorothy Wilson married in 1915. After the end of WW1, his parents and sisters Dorothy and Muriel registered as electors, giving The Croft, Easthorpe, as their address. This is also the address stated to have been Donald Richardson’s home address by his next-of-kin when he was registered as an absentee voter, but there is no other record of Donald and Mary living there. Perhaps Mary Hickling stayed with her in-laws during the war and in 1918 registered her husband as an absentee voter. The couple may have moved soon afterwards, but this is not confirmed. What we do know is that Donald is never listed as an elector in Bottesford. His connection with the parish appears to be tenuous. Donald Hickling Richardson died in 1977, aged 84, at Torbay, and Edith Wilson died in 1984, also at Torbay, aged 93. We have no further details of their life after WW2. Few details have been uncovered regarding much of his service career. Donald Hickling Richardson served with the Notts and Derby Regiment (The Sherwood Foresters) and had the rank of lieutenant. However, a newspaper account of his exploits in 1918 state that he first enlisted with the Kings Royal Rifles, and received his commission in 1915. 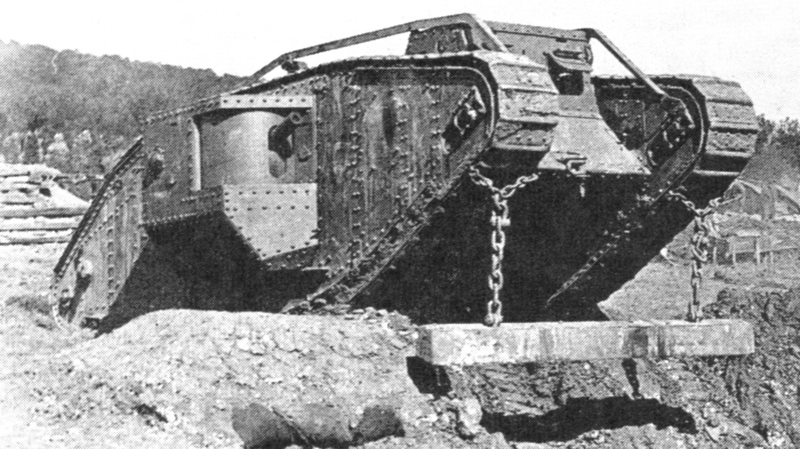 At any rate, in 1916 he transferred to the newly formed Tank Corps, where he rose eventually to the rank of major. 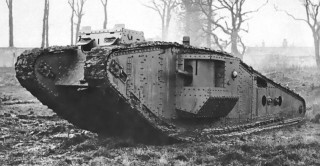 However, one short episode in his army life is well recorded, being his role as commander of a tank with the informal name of ‘Fray Bentos’ during the Battle of Paschendale in 1917. 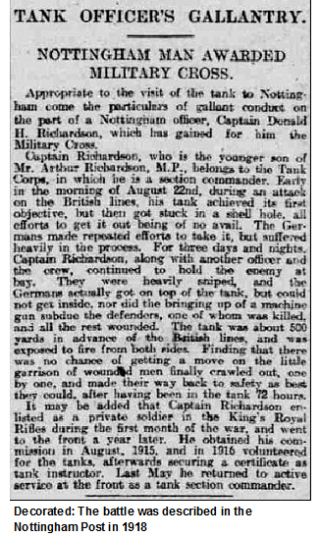 Apparently, Richardson had become a wholesale grocer before he enlisted and had been an agent from Fray Bentos canned meat (see article by Jasper Copping), hence the nickname given to ‘his’ tank. This was a Mark IV British tank which took part in the assaults on the German lines. It became caught in a shell hole, from which it was unable to escape in the water-logged ground, and so became marooned in the face of prolonged hostile gun fire. Captain Richardson and his crew held out for three days, until they escaped, taking their Lewis guns with them! Afterwards, Capt. Richardson and the driver 2nd Lieutenant George Hill were awarded the MIlitary Cross. Richardson also received the Croix de Guerre and promotion to Major. 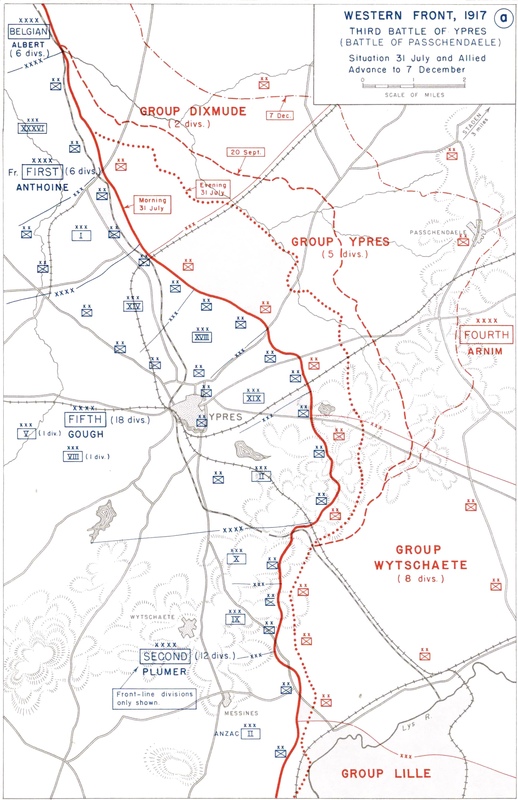 However, the action is most vividly described by an article by Jasper Copping published by the Daily Telegraph online, entitled “WW1 The Siege of Fray Bentos at the Battle of Paschendaele” (link). Readers are encouraged to look at Andy Pugh’s information and Jasper Copping’s account. Reported to have served with the Kings Royal Rifles and/or the Notts and Derby Regiment (The Sherwood Foresters) before he joined the Tank Corps.